Healthy Caramel Popcorn for Halloween or Anytime! Yes we said Healthy Caramel Popcorn! You guys know we gave up the whole paleo label a while back so don’t act so shocked to see a popcorn recipe on our site (hehe). We don’t eat this all the time, in fact we never really do BUT we thought it would be the most perfect, fun, healthy Halloween recipe! This epically fun recipe is brought to you by our favourites Supabarn! Yay <3 They even have fresh popped popcorn at the Casey store! See… LOVE. We reckon the kids will love it too! We even gave some to Dan’s kids and they gave their tick of approvals (this is kind of epic!). 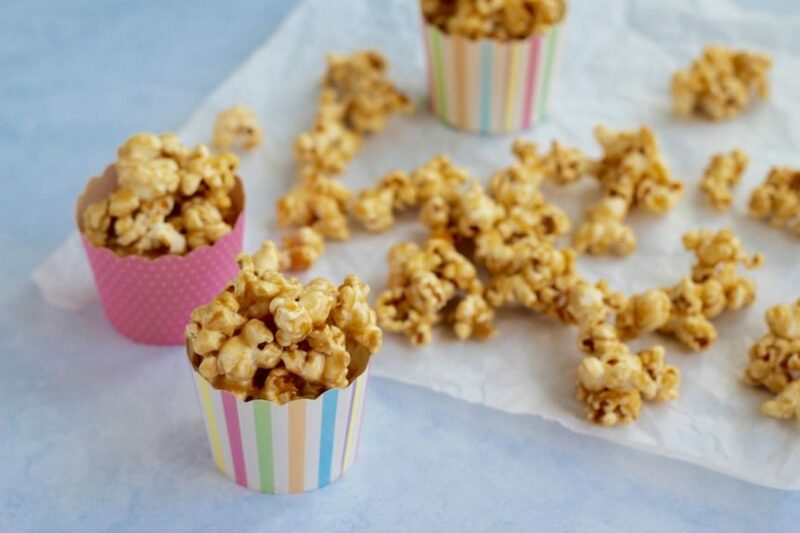 YAY for Healthy Caramel Popcorn for Halloween or Anytime! Halloween doesn’t really go crazy in Australia, pretty sure we’ll get zero trick or treaters to our apartment block. So yep, we ate all the healthy caramel popcorn, haha we feel like Halloween grinches right now. Maybe we better whip up some of these gelatin lollies as well. Just in case they come, we won’t tell them they’re healthy. Hehe, yep now we really are the Halloween Merry Grinches. Maybe there is an actual word for Halloween Grinch? Anyway, moving on! We think this recipe is also perfect for picnic lunches, kids parties and just a fun snack idea. Not an everyday snack but a weekend snack or a holiday snack. Coz like popcorn every day, especially caramel popcorn is not good for you. We know, this is not really a newsflash! Even though it’s all REAL FOOD, all the ingredients are good for you, they are all natural after all! The sweetener is still a sugar, a natural, better for you than sugar sugar. And corn is a grain. We only eat gluten free grains every so often. Because fun and yum. Our grain of choice: corn chips (now they are YUM!). And we think popcorn comes third, after white rice (in sushi, duh). What recipes are you making for Halloween? If you need more healthy Halloween recipes checkout this recipe collection! Or just checkout our sweet treat section (best recipe section ever on our site!). Have an epic day Merrymakers! Line a baking tray with baking paper. Leave this for now. Heat the butter in a deep saucepan over medium heat. Once the butter is melted test to see if it hot enough by placing a couple corn kernels in the saucepan. The corn kernels will spin around slowly in a circle if it is hot enough. Once hot enough, add all the other corn kernels and cover with a lid. Remove from heat when corn stops popping. Transfer to a large bowl. Discard any un-popped corn. In another saucepan on medium-low heat place the rice malt syrup, tahini, butter, vanilla and salt, keep stirring until it melts and combines. Bring to the boil and keep it boiling for 1 minute. Stir well and don't take too long or it will set! Spread the caramel popcorn mix onto the prepared baking tray. Set aside to cool, then break into pieces. YUM and fun! Add some roasted nuts for taste factor... YUMMM!